On Sunday morning, John McCain was interviewed by Jake Tapper on CNN's State of the Union. Among the subjects discussed were Donald Trump's allegations of wiretapping of Trump Tower by Barack Obama, Russian connections to the Trump campaign, as well as the scandal associated with Michael Flynn. What follows is a partial nonverbal analysis of some particularly crucial signals. JAKE TAPPER (beginning at 0:51): We learned this week that, General Michael Flynn, the former National Security Advisor for President Trump - was working as a foreign agent last year - while he was advising President Trump's campaign. Flynn notified the transition team and the White House Lawyers about the work he had done for Turkey - but this information was not disclosed to the public, nor did he file the proper paperwork until this week. Does this trouble you - at all - that the National Security Advisor had been, until recently, a paid advocate for a foreign government? JOHN McCAIN: Jake there's a lot of things about our relations with Russia that, ahhh, ah, trouble me a lot. For example, why was the provision in the, ah, Republican platform, that called for the provision of defensive weapons to f-, Ukraine, after being invaded by Russia - why was that taken out of the Republican platform? Ahhhumm, clearly it was not the will of most republicans. There's a lot of aspects of this whole relationship with Russia and Vladimir Putin that requires further scrutiny and so far I don't think the American people have gotten all the answers - in fact, I think there's a lot more shoes to drop from this centipede. During 1:42 - 1:45, as John McCain says, ".... clearly it was not the will of most republicans ...", the Senator displays a strong display of disgust. 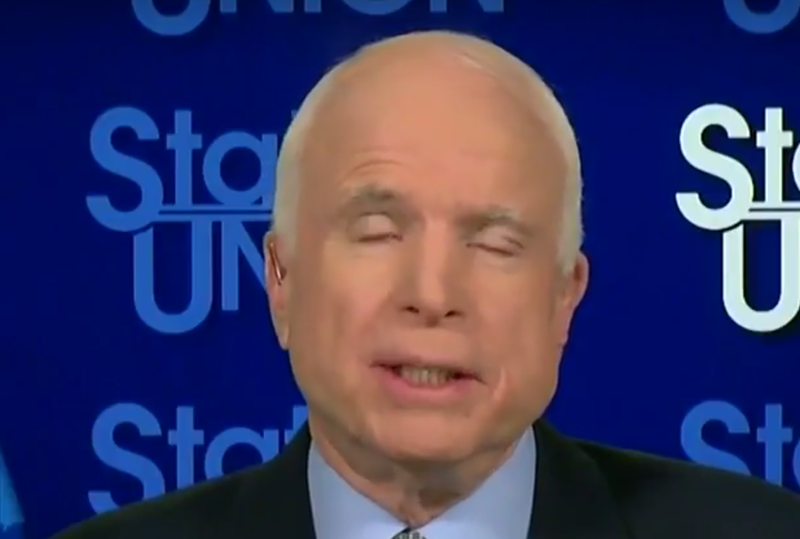 This is somewhat difficult to appreciate, as Senator McCain has a facial palsy on his left side. This can be clearly seen by the greatly diminished contraction on his left forehead as well as a slight to mild drooping on his left mid-face and corner of his left mouth. This is probably due to an old injury or perhaps a Bell's Palsy (idiopathic diagnosis of exclusion). At 2:00, just after he says, "I think there's a lot more shoes to drop from this centipede", Senator McCain again displays disgust - although this time it's coexistent with a component of contempt as well. TAPPER (continuing at 4:07): Speaking of assuming guilt, ah, a week ago President Trump made a stunning allegation. He tweeted that President Obama had wiretapped him at Trump Tower during the Trump campaign. On Monday, you said that if President Trump had any information that would indicate, that his predecessor wiretapped Trump Tower, he should come forward with the information - "The American People deserve it", that's your quote. The White House is supposed to hand over any evidence it has, to back this charge to the House Intelligence Committee by tomorrow - but a White House official this morning suggesting, ah, they might not - turn anything over. If there's no proof for what the President said, and we know that the FBI director has said it's not true, and the former director of National Intelligence has said it's not true, should President Trump take back his charge and apologize to President Obama and to the American People? 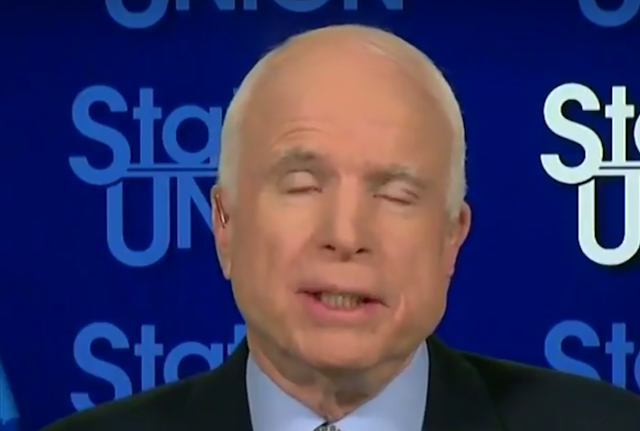 McCAIN: [prefaced with a moderately deep inhalation] Well, th-, President Trump has to - provide the American people - not just the intelligence committee - but, the American people, with evidence, that, ah, his predecessor, former President of the United States, was guilty of breaking the law because our - Director of National Intelligence, General Clapper, testified that there was absolutely no truth to that allegation, so, ah, I, I think t-, the President has one of two choices, either to retract - or to provide the information that the American People deserve, because if his predecessor violated the law - President Obama violated the law, we've got a serious issue here, to say the least. During 4:15 - 4:17, note just after Mr. Tapper says "wiretapped" in the sentence, "... He tweeted that President Obama had wiretapped him at Trump Tower during the Trump campaign. 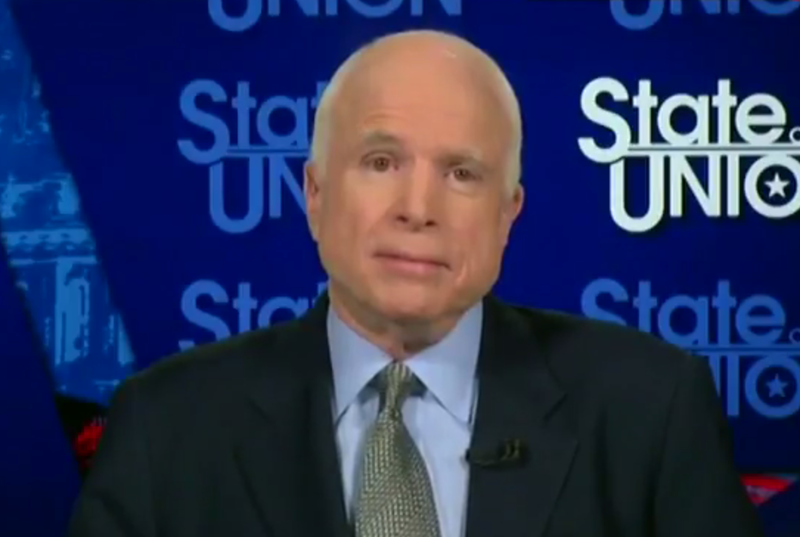 On Monday, you said that if ...", Senator McCain makes an extremely deep inhalation. While, he has, at times, a better poker face than many (able to consciously suppress his facial expressions), this somewhat subtle signal is quite significant for considerable anxiety. During 4:30 - 4:31 as Jake Tapper says, "... charge to the House Intelligence Committee ..." - and again during 4:33 - 4:34 as he says, "... official this morning suggesting, ah, they ...", Senator McCain makes several hard swallows. These are extremely common nonverbal signals - yet are rarely appreciated in everyday scenarios for what they are - highly correlated with significant anxiety. 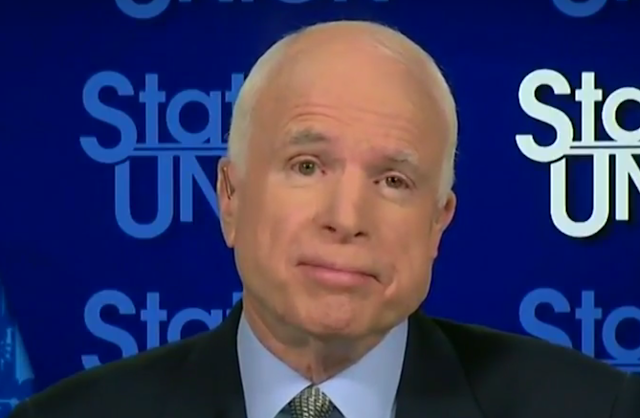 During 4:58 - 5:00, as he says, "... American people - not just the intelligence committee - but ...", John McCain displays an excellent example of a Self-Righteous Head Wiggle (SRHW). The self-righteous head wiggle is characterized by a high frequency, mild-to-moderate amplitude, side-to-side, wiggling back-and-forth of the head and neck (and sometimes the torso and jaw) is often displayed by those who are relative alpha personalities and/or during high alpha-moments - e.g., those of extra high confidence - during the expression of especially strong opinions. While not required, this nonverbal is also amplified by the additional component of increased frequency and duration of eyelid blinking. These last three signals described (deep inhalation, hard swallowing and SRHW) are not captured adequately via still images - please view these body language displays in the dynamic context of the video. 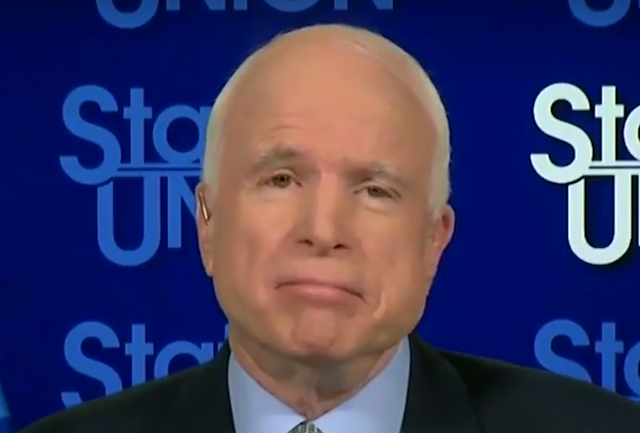 Summary: John McCain's nonverbal behavior in this interview indicates he has contempt and disgust for Donald Trump - moreover it also strongly suggests that McCain believes there was collusion between Donald Trump and/or some members of Trump's staff with high-level Russian officials and/or Russian surrogates.